I don’t usually comment on other people’s reporting, but I couldn’t let a Bloomberg News report of a 1970s deal with Saudi Arabia, a deal to mortgage America to ensure cheap gasoline, pass without stating how nauseating it is. And so it has been until today. The Saudis may have asked for secrecy, but secrecy suited American politicians and Generation Greed in general as well. They didn’t want to face just how much of America’s future they were selling off so Americans could have cheap gasoline in the past. It was just too embarrassing. This shows the reality of the values of a generation if nothing else does. What a disgrace! Any objection to foreign oil dependence is usually shouted down by global warming deniers. If scientists are right, global warming may indeed turn out to be the greatest long-term damage from the global fossil fuel binge. But how can anyone deny the short and intermediate-term harm to the U.S. economy and national security of decades of oil imports from countries where many people hate us? Global warming is number three on the list of terrible consequences, one not even considered when the first two consequences became apparent in the 1970s. Oh they wanted to keep that a secret all right. No one has dared to talk about it since Jimmy Carter. It is a national disgrace, one of the greatest failures of Generation Greed, as I wrote here. In April, Saudi Arabia warned it would start selling as much as $750 billion in Treasuries and other assets if Congress passes a bill allowing the kingdom to be held liable in U.S. courts for the Sept. 11 terrorist attacks, according to the New York Times. The threat comes amid a renewed push by presidential candidates and legislators from both the Democratic and Republican parties to declassify a 28-page section of a 2004 U.S. government report that is believed to detail possible Saudi connections to the attacks. To have this come out on Memorial Day, a day that is in theory set aside to honor those who have made the ultimate sacrifice for our country, makes it more nauseating still. Our entanglements in the Middle East, which have led to many of our young people becoming dead or disabled in related wars, stem in large part from the unwillingness of most Americans to pay an extra dollar a gallon for gas. With an extra dollar a gallon, some of them might have to ride a bus or bicycle sometimes. They might have to carpool. They might have to own a smaller car instead of a large SUV. The horrors! The craven gutlessness of two generations of politicians, on their knees on behalf of two generations of needy and greedy Americans, offends me as American. I am also a New Yorker, however, which means I have nothing against Muslims, Arabs, or even Arab Muslims, or anyone else. And a Christian, which means that I believe people the people in the Middle East, and in China, and in India, etc are to be valued as such. And thus a free trader, a person that is happy that in the developed world millions have been pulled out of abject poverty over the past few decades into a better life. In fact, development economics is something I studied in my younger days, and international aid has been at the top of our charity list. I know who the real poor of the earth are. Trade doesn’t work for anyone in the long run if imports are not paid for, but are instead funded by debt. If you pay for imports with exports, jobs will be gained from exporting to offset any lost from importing. But the U.S. has been living beyond its means, and selling off its future, since 1980 in a long national party held by and for the benefit of Generation Greed. That debt-funded consumption is the only problem with most of our trade, as I noted here. Importing oil, however, is far, far worse for us, and not nearly as good for them, as importing stuff from China, South Korea or Mexico or speaking to those at call centers in India or the Philippines. Businesses have to hire people to make that stuff and answer those calls, and pay them. Not as much as they should be paid? Perhaps. Not in the environmentally friendly environments we expect in the U.S.? Perhaps. But more than they would have been paid otherwise, or they would not have taken the job. That is what Ronald Reagan had in mind in 1981 when he advised poor countries to rely on trade, not aid, to lift their people out of poverty and starvation. Importing oil is different. No one makes that oil. It is just there in the ground, providing mass riches to whoever can gain control of it. Violence, corruption, and oppression are often the result. There is blood oil just as there are blood diamonds and blood ivory. To the point where development economists, noting the continued backwardness of many countries that are rich in mineral resources, and the rapid development of many countries that have none, now count mineral resources as a negative for economic development. The vast majority of people are better off without them. Saudi Arabia shows what can happen in a mineral rich but otherwise backward country. The oil is the property of the kingdom, which is the property of the royal family. Guest workers do the work. The rest of the people are on semi-welfare, sharing the wealth only by the sufferance of the royal family only by accepting vassalage to those in charge. It is only a modest stretch to say that by importing oil the U.S. has had the same effect on Saudi society that importing illegal drugs has had on Mexico and other countries in northern Latin America. The easy but humiliating and empty life of most Saudi citizens leads to deep-seated anger, which the Saudi royal family deflects by allowing it to be shifted to scapegoats. Donald Trump may encourage Americans to scapegoat Muslims, but Saudi Muslims are encouraged to scapegoat the United States of America. Oil imports have left us tangled up with a long of miserable people looking for someone to blame. The greater our involvement in the Middle East, the more people there blame us for their problems. Rather than themselves or, conveniently, their rulers. Miserable people are easily manipulated, it seems, particularly when reality is hidden in secret. And they want to keep us tangled up. The Saudi government manipulates the oil price to discourage conservation, alternative energy, and domestic fossil fuel supply. Gasoline may be cheap now, but oil will be back at $100 per barrel, and gasoline at $4.00 per gallon, once all the U.S. oil producers – and all the solar energy companies – have been bankrupted. How is that for the free market in action? And yet our politicians do nothing, say nothing, out of fear that saying something might allow some other politician to accuse them of being against cheap gasoline. “I want for me now!” A generation of two-year-olds, selling off the future of two year olds because it feels itself to be so needy. But…I have to! But…I can’t! Why can’t I have what I want! As a patriotic American, I want lower miles per gallon! One person in a huge vehicle with an U.S. flag on the bumper. And how deep seated is this silence? How many Presidents have there been keeping this secret for 43 years? How many top federal financial officials? Of both political parties, which are allegedly at each other’s throats? Except when it comes to robbing future generations and the future of the United States, and not talking about it. And meanwhile, how do Ronald Reagan’s words of advice to poor countries sound –after the 35-year debt financed U.S. consumption party that began with his administration? Right. Discipline. 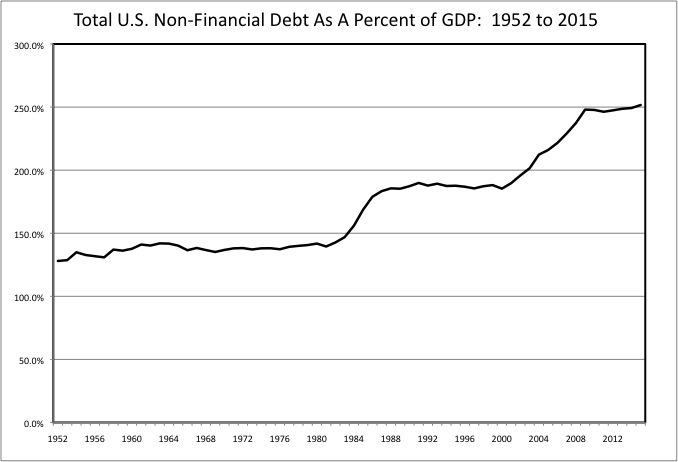 Note the Reagan and Bush II national parties in this chart, which shows all U.S. non-financial debts and not just the national debt. We are the banana republic Reagan advised other countries to stop being. With oil imports the worst part of it. This recent revelation really puts the past 35 years in perspective. Think about what it means. Think about the values behind it. Think about the consequences. Think about some Saudi nutcase getting control of all that “military aid and equipment” the U.S. has sold as the world’s leading merchant of death, and using it against Americans. It is just nauseating.